The article said, “Thanks to the precise planning and behind-the-scenes work of the Aecon Concessions group, the Bermuda Airport Redevelopment project has been checking off one milestone after another since the start of construction. 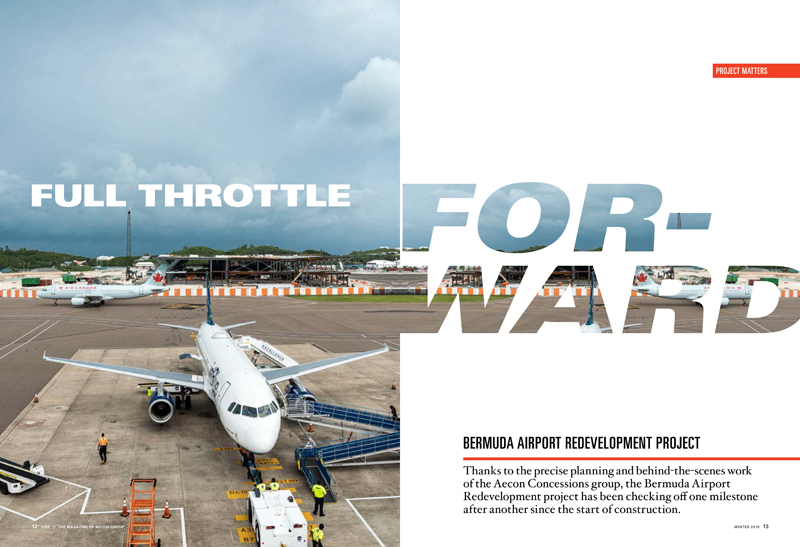 “It’s been just over a year since Aecon launched the highly-anticipated Bermuda Airport Redevelopment Project. 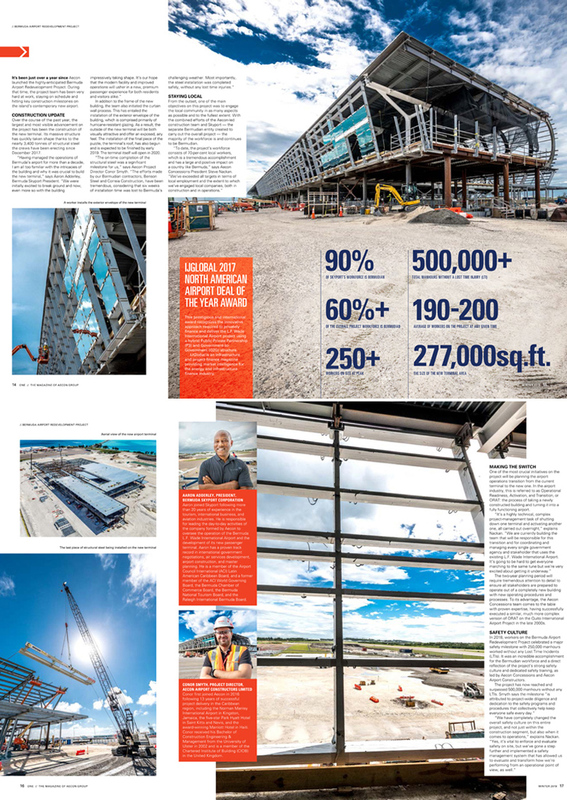 During that time, the project team has been very hard at work, staying on schedule and hitting key construction milestones on the island’s contemporary new airport. “Over the course of the past year, the largest and most visible advancement on the project has been the construction of the new terminal. Its massive structure has quickly taken shape thanks to the nearly 3,400 tonnes of structural steel the crews have been erecting since December 2017. “In addition to the frame of the new building, the team also initiated the curtain wall process. This has entailed the installation of the exterior envelope of the building, which is comprised primarily of hurricane-resistant glazing. “As a result, the outside of the new terminal will be both visually attractive and offer an exposed, airy feel. The installation of the final piece of the puzzle, the terminal’s roof, has also begun and is expected to be finished by early 2019. The terminal itself will open in 2020. “From the outset, one of the main objectives on this project was to engage the local community in as many aspects as possible and to the fullest extent. With the combined efforts of the Aecon-led construction team and Skyport — the separate Bermudian entity created to carry out the overall project — the majority of the workforce is and continues to be Bermudian. You can read full magazine here [PDF]. Looks AMAZING! thank you OBA! Ya, thanks for giving away $45 Million of revenue a year for 30 years. If you have done your homework you will know that although we are giving away a significant amount of revenue, including ALL direct and indirect costs of running the current airport, the bottom line was at best break even, and we would not have been in a better position if we’d borrowed the money to pay for a new one with the interest and running costs. We are better off with this contract than without it. The airport redevelopment is also considered as positive factor in our latest ratings report. Well thank you for putting us $2.5 BILLION in debt and “losing” $800 MILLION. Also thank you for continuously commenting so that we can keep making plpers feel ashamed. Hey it just occurred to me that $30M (a more realistic figure) per year times 30 years = $900,000,000 which is about as much as the “missing” amount. Weird or what? Aye, has de Pee El Pee ever completed a project on time and on budget?! I’ll wait!! Hahaha!! LOL Something like the PLP giving 60+ million away in 1 year on the Berkley construction. I am so glad that the OBA realized this was a smart deal. PLP lovers don’t understand how 45 million in revenue is paying for the airport- we get an airport on time and on budget, and paid for in the end. PLP would have brokered something like the dock at dockyard and we would have seen delays and overruns among other things. Sad that PLP supporters can only think what their bosses tell them. If they thought it through objectively, they would know the airport was a good deal, like others have proven it to be. No doubt that the finish product will be on a next level (for 287 Million it had better be) But could there have been a better way? We will never know.. When you soak a country for a billion dollars..
You better say nice things.. The plp soaked us for $2.5B, and all they do is trash gays….clean up your own backyard first, rhonda. We can trash gays if we want! It’s a personal choice so get over it! We gave far too much away on an airport we did not need. No one needs a hotel as a departure lounge. Ever been to Hawaii? Simple is best and it don’t cost a billion $ in cost and lost revenue! Another OBA failure! Are you saying Ewart should be saying nice things? This airport should be renamed Wade-Richards Airport. Still acknowledging Freddie Wade however at the same time giving credence to Bob Richards for all that he has done this bring this dream a reality. Bermuda International Airport. Best name for the airport. Best name to put the airport and Bermuda on the map especially for in print and on the www. Every respect for people are named for buildings or streets etc but for this major airport needs an ‘international’ name…. Bermuda International Airport.